West Windsor, N.J. -- The opening reception of the the "Visual Arts Student Exhibition" at the college's Gallery on April 25 was, quite literally, a clear illustration that the visual arts are alive and well at Mercer County Community College. With 68 artists and more than 130 works on display now through May 17, the reflects the talents and artistic visions of MCCC's diverse group of art students. According to Gallery Director Tricia Fagan, some of those represented in the show are young people just beginning to spread their wings as artists, while others are adult students who paint in addition to other jobs, or who, as retirees, finally have the time to pursue their art in earnest. The Gallery is located on the college's West Windsor campus, 1200 Old Trenton Road. Student Sam Acuff, of Hamilton, has three paintings in the show. The 20-year-old began at Mercer in the fall of 2010 with the intention of studying biology. But he quickly changed his focus to art. "If it's something you are going to do for the rest of your life, you should have a passion for it," he says. Acuff's chosen medium is spray paint. "It's a temporary medium that allows me to expect more from myself each time." The Nottingham High School graduate says he often depicts friends in social settings. "These are people I know. I try to make the work as sincere as possible. I document a moment in time." Acuff adds that he has had great instructors, including faculty members Lucas Kelly and Kyle Stevenson, who have pushed him to work hard and given him the technical critiques he needs to improve. A first this year for the student show were prizes awarded by the Garden State Watercolor Society. Allison Singer, of West Windsor, won first prize for "Checking the Competition"; Tom Kimball of Chesterfield won second prize for "Lady with a Big Hat"; and Litza Reyes of Trenton was awarded third prize for "Fresh Air." For photographer Beth Gross, of Hamilton, Mercer was her starting point fresh out of high school, where she earned her associate degree in Photography in 1982. Now back at MCCC to enhance her technical skills and earn a degree in Digital Media Arts, she says, "I love Mercer. The facilities and equipment are all up to date." Guadalupe Reyes, of Hamilton, who was prominently featured in last year's show, returns with three paintings. 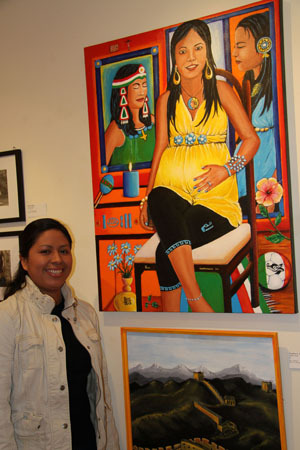 Her distinctive style uses bold colors and draws inspiration from her cultural heritage. In "A New Beginning," which depicts a serene, noticeably pregnant woman, Reyes incorporates references to the Mayan calendar and religious figures. Reyes says her Mercer classes continue to help her improve her art. "I am taking advantage of really good teachers. I take as many classes as possible." Another adult student, Jaime An-Wong, has mostly done sculpture. At Mercer, she has begun to paint in oils with Professor Mel Leipzig. "He has really inspired me," she says. "I'll come to class as long as he is teaching it." In An-Wong's "Beach Day," her background in sculpture is hinted at in her addition of 3-dimensional pieces of cloth in the painting's upper corners. The exhibit features more than 130 works by 63 of visual and graphic art students. Three-dimensional works feature wood, Styrofoam, ceramics and found objects. Two-dimensional works include oils, watercolor, spray paint, acrylic, printing inks, mixed media, charcoal, gouache, and photography. Gallery hours for the exhibit are: Sundays, 11 a.m.  1 p.m., Mondays, 10 a.m. - 12 p.m.; Tuesdays, 11 a.m. - 3 p.m.; Wednesdays, 11 a.m. - 3 p.m., Thursdays, 11 a.m. - 3 p.m., and 5  7 p.m. For more information, call the Gallery at 609-570-3589 or email gallery@mccc.edu. For additional information on the Gallery, click here. This show is supported, in part, by the Mercer County Cultural & Heritage Commission through a grant funded by the New Jersey State Council on the Arts/Department of State, and the Mercer County Board of Chosen Freeholders. For more photos on Facebook, click here. For more details about the show, click here. 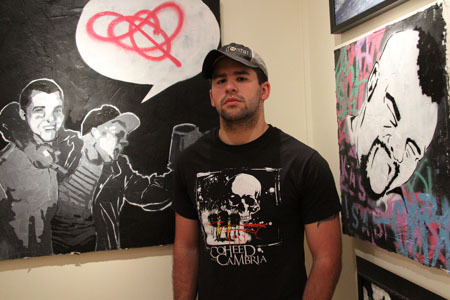 Sam Acuff with two of his spray art pieces. 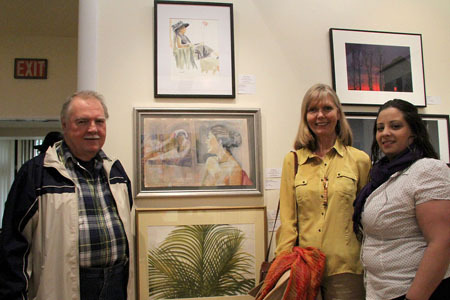 Winners of prizes from the Garden State Watercolor Society are, from left, Tom Kimball, Allison Singer and Litza Reyes. 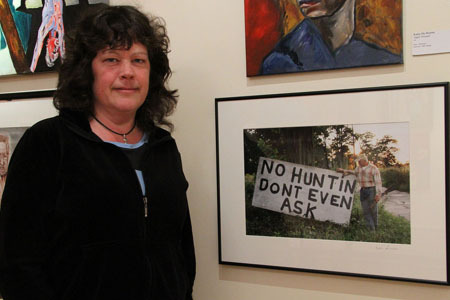 Beth Gross with her photograph, "No Huntin.'" Beginning," includes references to Mayan culture.